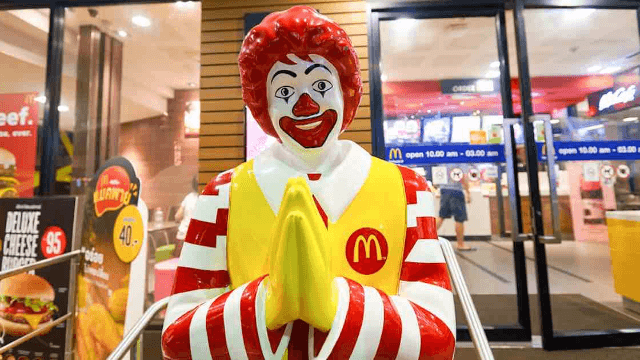 Guy goes on hilarious Twitter rant begging McDonald’s to adopt the ‘McSh*tter.’ They won’t. A prolific and popular tweeter who goes by the handle @Dril thinks McDonald's needs a marketing shake-up and he's definitely, definitely thinking outside the bun. (Yes, that slogan is from Taco Bell not McDonald's, but it's very wise). Because @Dril doesn't think the Hamburglar is scary enough for 21st century fast food, he's pitching the idea of the, ahem, "McShitter." His wild rant has found its way to the blogosphere and Imgur, where it's getting even more popular. Will McDonald's be forced to respond? @McDonalds i have an a 1 million dollar idea that will pull your failing company directly out of the toilet. hear me out. Right off the bat—no, McDonald's is not going to respond. @McDonalds they fear Chaos. they fear those who dont simply loot and plunder as the hamburglar does, but those who seek to Destroy. @McDonalds your current slogan, "Im Lovin It", will no longer do. i would suggest replacing it with "Look out. Here comes the McShitter"
That slogan is certainly to the point. I'm sure you are, @Dril. Now all we do is wait, patiently, for the fan art. Until then, kill time by learning how the Hamburglar got his stripes. He's so scary.